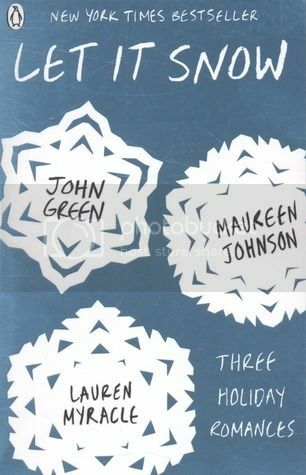 Let It Snow by John Green, Maureen Johnson & Lauren Myracle - An ill-timed storm on Christmas Eve buries the residents of Gracetown under multiple feet of snow and causes quite a bit of chaos. One brave soul ventures out into the storm from her stranded train and sets off a chain of events that will change quite a few lives. Over the next three days one girl takes a risky shortcut with an adorable stranger, three friends set out to win a race to the Waffle House (and the hash brown spoils), and the fate of a teacup pig falls into the hands of a lovesick barista. A friend of mine bought this for me last Christmas as she knew it was on my wishlist. I decided to save it to read until this festive period to help get me in the mood. Let It Snow is a really sweet book with three pretty cute stories, but I felt a little let down. Let It Snow is a book of three interconnecting novellas. The first story, The Jubilee Express by Maureen Johnson, is the story of Jubilee, who, after her parents are taken to prison for being involved in a riot over buying rare Christmas village pieces, gets stuck on a train on her way to her Grandparents'. Jubilee is supposed to be spending Christmas Eve with her boyfriend, and is not happy at the change of plans, and is even more at a loss when a huge snow storm stops her train. Rather than spend all night on a freezing train, she decides to go to the nearby Waffle House, where she is followed from the by 14 cheerleaders and a boy called Jeb. At the Waffle House, she meets Stuart, who might just change her mood. Next comes A Cheertastic Christmas Miracle from John Green. Tobin is spending Christmas Eve with his friends JP and the Duke watching Bond movies while his parents are stuck in another state, their flight delayed by a storm. Keun, their other friend, calls them up from work at the Waffle House, announcing that here are 14 hot cheerleaders in the restaurant, and he needs them to get to the restaurant with Twister ASAP, because his other two colleagues' friends do, because they're only allowing one more group of people in. It's then a race to get to the Waffle House through the snow and various other obstacles before anyone else does. Through their journey, Tobin realises there might be more to his friendship with the Duke than he thought. Finally, there's The Patron Saint of Pigs. Addie has having a crap Christmas as she cheated on her boyfriend, Jeb, a week ago, and she's regretting her mistake hugely. Her friends think her problem is down to her being too self-absorbed, so she tries to prove that she's not by promising to pick up her friend Tegan's new Teacup Pig during a break at work the next day from the pet shop. Only things don't go according to plan, and while she's panicking about letting her friend down, she has a revelation. I don't want to say too much more about the stories, because they are short and I don't want to spoil them. You can see they all interconnect from my summaries of the stories, but they interconnect a lot more. All the characters that live in the town know/know of each other, so there's some reference to almost everyone in each story. Each story, as I said, is really sweet! It's one big story, really, with everything coming together at the end, but with very different writing styles that somehow just work together. They don't see disjointed, despite feeling different. I've never read anything by Maureen Johnson or Lauren Myracle before, so it was great to get to try them and enjoy their stories. However, what I felt let down by was the Christmas aspect. Johnson's story was set over Christmas Eve and Christmas Day, Green's over Christmas Eve into Christmas Morning, and Myracle's over Christmas Day and Boxing Day. Despite that, the stories had very little to do with Christmas. There was the snow, but you can have snow when it's not Christmas. Snow doesn't make things Christmassy. The stories could have been set any other time. Something other than snow could have stopped that train and caused traffic problems that led to these stories - like rain! So Jubilee's parents went to jail for something related to Christmas. But that's really the only Christmassy thing in these stories. There is no focus on a big meal, on opening presents, on spending time with family, on playing games, the things that are a major part of Christmas. There are aspects of this in The Jubilee Express, but for minor characters, and you don't get to see it happen, really. When I'm reading a Christmas book, I'm expecting Christmas stories, and these weren't really. There was nothing in these stories to get me in the mood for Christmas. So I felt quite let down by that. Either way, still a really good book with three great stories! Just don't expect it to be too Christmassy. I have never heard of this book but it sounds really good. I like how it has more than one novel in one. The Patron Saint Of Pigs sounds really interesting. I'm glad you enjoyed it, setting aside that it has nothing to do with Christmas. I really loved this book when I read it. It was good, and it had me pulled me in from the start. But I agree with the point that you don't get in the christimas mood.